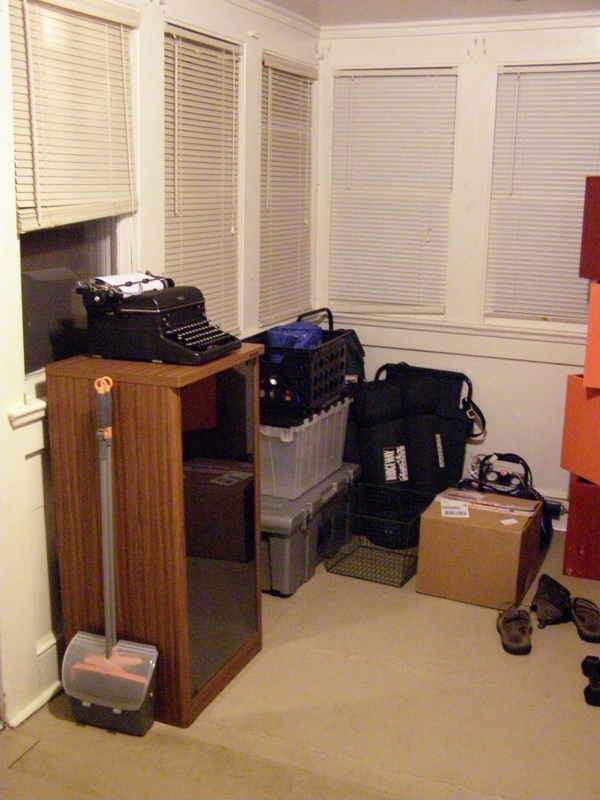 This is the mud-room; I call it my clutter room. It was the best place to tuck a storage cabinet, the only negative is that I must lug these machines across the house to use them here. It's not that far. Ha ha, even your clutter room looks neat! I have added JP's blog to my personal list, the Writing Ball blogroll, and the Welcome to the Typosphere blogroll. Prompt service, eh? 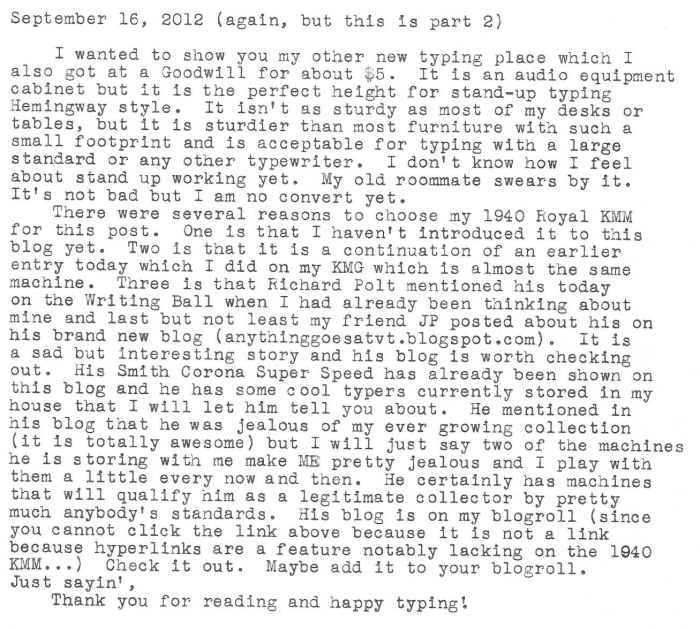 I saw you said the KMM was your fastest typer, BUT: do you have a Smith Corona Super Speed and is it slower because my KMM can't quite keep up with even my super rusty Super Speed. Standing workstation hey? How interesting. Might have to try a setup of my own soon. Clutter means stuff that has no other place. If you restrict it to one room, the rest of the house is neat. This is my single organization rule and it works really well. I'll be watching for your evolving opinions on the standup desk. THAT'S not clutter...but I love the standing desk idea. I've been thinking of trying it too. I've heard nothing but good things. I have heard of this standing desk thing, but have never tried it. I like to get really comfortable in my chair. The one I have been using is all wood, but I have been looking into one with some cushioning. 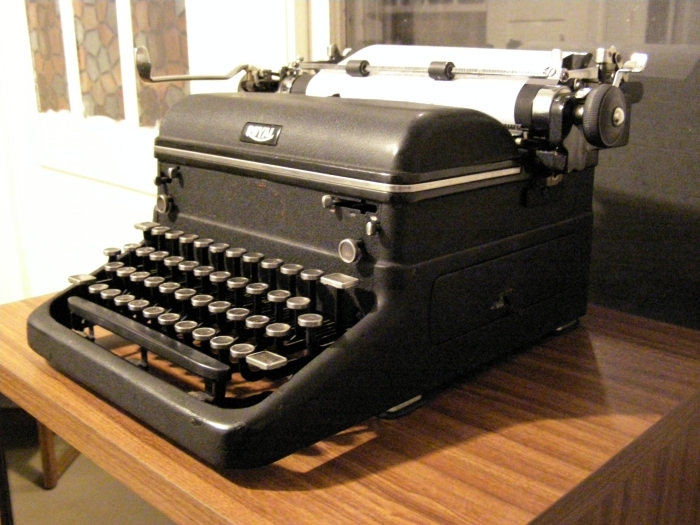 Hell, if I can get comfy on a wooden chair, a cushioned chair (like the one at my computer desk) would be a dream for late night typing. Thanks for sharing, and I have been checking out your friend's blog. Good recruiting!